Grabbing the attention of your potential customers is one of the first things to consider in any marketing campaign. The more you get popular and familiar among your target audience, the more are the chances of an increased and a whopping ROI. And let’s be honest, that’s one of the most important primary goals of any businesses. However, building your brand awareness and driving more traffic to your website is not a linear task and definitely not an easy one. It takes a lot of efforts, time and most importantly, an effective marketing strategy. In the world we live in today, digital marketing is an inevitable part of any successful business. And the important strategy that governs the success of any campaign is content. While content is the important guiding forces in making your brand image, it is not the only one. As in the words of Mari Smith, “Content is king but engagement is queen and the lady always rules the house”, it is clear that engagement is one of the significant things which is hard to achieve. 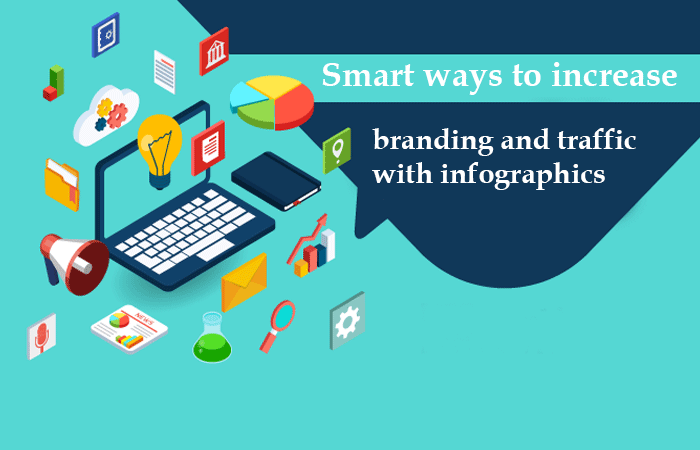 In building a brand image and promoting effective communication with potential customers, Infographics are known to play a major role very efficiently. By using them in the correct manner, one can achieve the desired results and increase the traffic to their website. There are several reasons why this happens. For this, let us first take a close look at what are infographics. In plain language, infographics are nothing but visual content. It comprises of text and graphics. It displays a visual message which is factual and analytical in nature.Infographics are indeed smart tools that help in posing the complex content in a manner which is more comprehensible to the people. It is more understandable and works great in communicating the factual and analytical information effectively. However, unlike regular images or graphics combined with a copy or text, Infographics are pieces of information which alone can convey the message or a fact for efficient communication between the brand and the target audiences. As discussed about the importance of engagement earlier, many businesses are leveraging the use of infographics for engaging their target market and driving traffic to their website. When an infographic is published correctly with the right content, design, and layout, it can provide an accelerated return on investment (ROI) which is desirable in any business. Coming next, the question raised is why should you use Infographics for your business? There are multiple reasons for doing so. Primarily,it is because they are the best way of engaging a large target audience with your brand. This will increase your branding and will help in building a strong brand image. Infographics also promote the message in the most concise manner and in a very easy to read manner. They communicate a specific message, present a large amount of information in a compact and easy-to-understand way, analyze data and monitor the route of certain parameters. Benefits of using infographics to increase the branding of your business are numerous. Being the visual and analytical in nature, they are more perceptible to the human mind and are more attention-grabbing. In addition to this, they are compelling and attractive, have a high viral capacity, are easily scanned and viewed by a mass audience, embeddable, have high area coverage, works wonders in promoting the brand awareness, improve your search engine optimization (SEO) ranking. Using Infographics for your business also shows that you have a high understanding and expertise over a topic which can become a very big plus point in gaining the trust of your potential customers. All these things combined works great in driving the traffic to your website and increasing your branding image. If you wish to learn more about infographicsanddigital marketing, you can visit http://www.readcolors.com/.ReadColors Technologies Pvt. Ltd. is one of the most prominent digital marketing agency in Gurgaon that helps businesses reach new milestones in the age of digitalization. You’ll find here a number of similar informative and insightful blogs like this one. ReadColors strive to make your brand image a strong one and help you achieve the new standards in the digital marketing era.